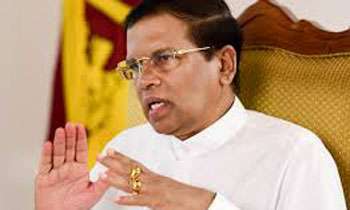 President Maithripala Sirisena today said he made a humble appeal from the friends of the media not to shed tears after attacking, weakening and destroying the government by way of destroying the enabled democracy and media freedom in the country. The President said he was making this request from the media institutions which did not give a proper coverage to the government but obstructed it. Addressing the ‘Water Filling Ceremony of the ‘Moragahakanda – Kaluganga Reservoir’ at Laggala, he added that when the people watched private TV channels, in the afternoon, they were compelled to feel that there was no government, there was no administration, no law and order and no governance but only misery, mayhem and sufferings. “Both, the print and electronic media in the private sector in many instances used an unimportant but sensational statement of a politician or top government official - in many instances a slip of the tongue - to attack the government and its action. What they try to depict is that this government has done nothing for the people. But I request you, not to forget the freedom, dignity, self-respect we gave you after January 8, 2015. I never ask you to take the government’s side but tell the truth. Show the truth and print the truth. Don’t forget that you give publicity to all these negative and malicious comments against the government while enjoying the independence, democratic rights and dignity this government restored for you,” President Sirisena emphasized. In that case you should be more in the country and advising the public on the good development undertaken. This fakwr shamelessly telling he is guarding media freedom while once tried to ban fb permenently and few months ago destroyed part of tnl tv for revealing his wrong doings. I am not a fan of this gentleman but in this case I will take his side. Media was silent during MR`s period because they know what will happen if they open up. Now these medias are enjoying the freedom but what they show to people is only the mistakes of the government. prevent the corruption and everthing will be ok.You cannot blame the media for covering all your incapablities, not just as leader, but also as humans. Don't shed tears after people unceremoniously send you home in 2020. Seems like you have a better alternative for 2020. Please tell us. Like to hear about it. We also need a better leader who can run the country with educated decent group of 225 MPs. I guess ...congradulations YP government...!! Point taken...keep up the good work and the press will do a fair job..! This is very true President. But many ways you and govt failed. Mainly to get creditable investigations over well know persons who stolen millions and millions of people's money. Already resigned to the fact that there will be change of govt soon. I can't disagree with the president this time but for some reason the public seems to only be interested in drama and irrelevant news while ignoring the good. Something I've noticed on Daily Mirror is that articles depicting the government (and politicians as a whole) as useless gets many comments while anything good about them gets few or no comments - some might argue that the government actually does nothing, but statistics say otherwise. This could be a result of trust issues with what the government says as they failed to deliver campaign promises. You do well to get on with your job for which the tax payer pay you for, and let the press do theirs. The press are a much tougher bunch than the politicians and they could weather any storm. Yes. Correct, the news shows in P.chanels are disputes among family, husband and wife and pin-point that the country is in trouble. I agree with the President. I find that people do not have any pride that they are citizens of Sri Lanka. they only peal negatively about the Country and blame it on the Government. What I appreciate most about this Government is that now there is an air of freedom and security. This was not there before 2015 and remember we were heading for a cruel dictatorship. Press freedom is there as long as you aŕe not mean to Yahapalana. Dear president I have to tell you the truth, i have noticed you mouth will open to speak some thing good only before some Election to come, after the election we can't see your mouth, Why is this, President, any thing WRONG ?